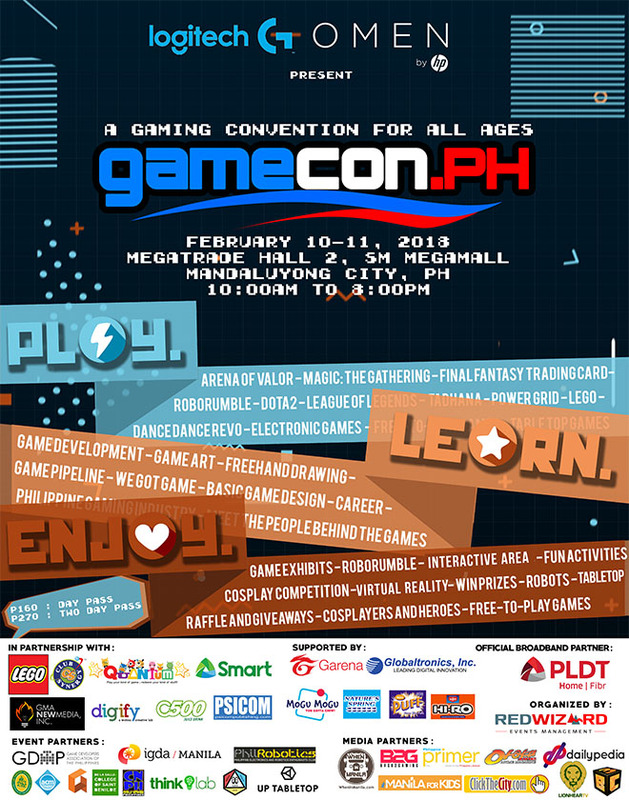 Less than eight months after its debut event, GameCon PH is back with a follow-up. The pressure is on as they’re expected to improve upon what they were able to come up with last June, and they’re doing more things to get more hype. I even got a call to attend their press conference on February 1, even if I’m just a two-bit blogger. Just like with the first event, I’d like to talk about what lies ahead in this preview. It does seem like the first GameCon PH was a success as they couldn’t wait for next June to put up a second event. This February is surprisingly convention-heavy, with other events like Otaku Expo and Cosplay Carnival joining the fray. I’ll make sure I can attend those as well, but I see this particular event as top priority. Unfortunately, I wasn’t able to attend the press conference due to work. They set it on a Thursday, and I have a full-time work now. It looks like they’re working with the framework of the first event and building on top of it, which is certainly a good idea. There will be makers, independent game developers, tabletop gaming enthusiasts, and retro game collectors, mixed with major studios, eSports showmatches, and various other organizations and establishments sharing the event floor. There will be much for gaming enthusiasts to see and do in the event, whether it’s the past, present, or future of games. Before the event proper, there’ll be two whole days of plenary and workshops and such for developers, artists, and other folks in the industry. Maybe this time, there will be even more cosplay and other usual convention shenanigans as more people become interested in attending this event. Tickets can be bought at all SM ticket outlets or online. It’s P160 for one day pass or P270 for the two-day pass, both of which provide free play in all interactive areas. GameCon PH is organized by Redwizard Events Management. You may also visit the GameCon Philippines official website, follow them on Twitter and Facebook, or contact them on 09179048777 and 09209734926. It’s going to be the second event I’m covering this year, the first one being Otaku Expo 2018 on February 3 to 4. With both that and GameCon PH 2018, I hope to apply what I learned from making event vlogs last year and refine my production so I can put them out more quickly and with better quality. Whatever I can do to improve upon what I did last June, I’ll try. The basic formula will still be the same, with me both reviewing the event and riffing while walking the event floor. However, I did do something extra for the GameCon PH 2017 vlog by promoting the booths, even going as far as showing their contact information just in case anyone is interested. It’s still a good idea now, but I’m not entirely sure if I can put in that amount of work this year due to time constraints brought on by my current work schedule. Another thing I’m concerned about is whether I can go on the second day instead of the first so I can catch the Robo Rumble. I plan to shoot the matches, then commentate on them like I do with wrestling matches in my other channel. However, I may be needed for a different engagement, so I may not be able to go. If so, I’ll just have to attend the first day like last year. Last year, I started to make event vlogs on a regular basis in an effort to both create more content for this thing I have going on and to combat my social anxiety. My initial campaign of event coverage in the second half of 2017 was mostly successful, being able to put out vlogs that I learned much from and can be proud of. GameCon PH 2017 was the first event I officially covered. Among all the event vlogs I did, this was the only event that I acquired media credentials for. For the most part, I’m not adverse to paying for a ticket to cover an event, but I just happened to have been given free admission for a day after leaving a comment in a thread calling for bloggers to cover GameCon PH 2017 in a Facebook blogging group. It was a fortuitous circumstance as I had a fun time in the event and even put extra effort into the vlog compared to other event vlogs because since I was able to get in for free, I had to put in extra effort to give back to it as courtesy for providing me a good time.